Sometimes projects just don't go the way you planned or they end up being too fiddly, too hard and well, just not very much fun. Sometimes you just have to admit defeat, realise it's not working and do something else, change angles or give up altogether walk away and leave it for another day. This was definitely one of those projects. 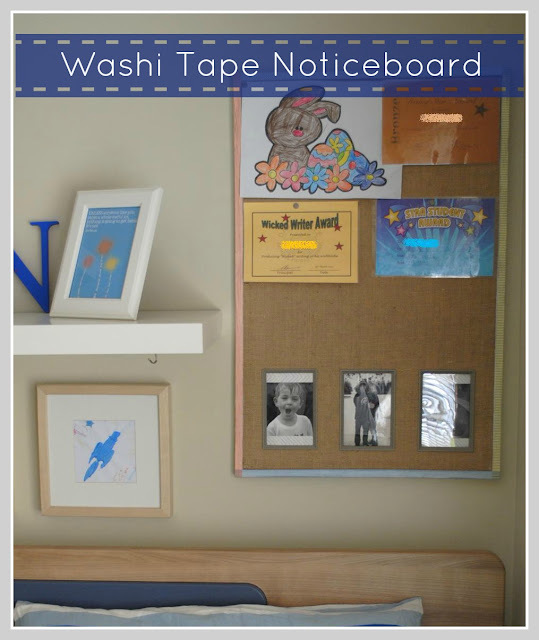 I bought this pinboard from Target quite a few months ago specifically for the purpose of taking the load off our fridge and to house the million and one notices, invitations, reminders and school info that comes into our home and ends up on the fridge. Once I got it home I realised uber-quickly that I was plain crazy - what was I thinking? It was in no way, shape or form big enough. I then thought it could go in the kids' playroom for some of their artwork ... ummm, nup. It was nowhere near big enough for the mountains of art that we keep on display. I also envisaged it all pretty and white so set about priming and painting it. There was my mistake right there. The paint didn't cover as I would have liked, even though the guy at the paint shop promised me it would. Grrrr. It would have needed to be sanded between coats and it probably would've taken 3 coats to make it look decent. I wasn't liking it, it wasn't working, it was a silly idea and I didn't want to do it anymore. Sulky, sulk, sulk. I gave up, put it in the shed and thought I'd get back to it at some point. Basically, what happened is I never got back to it and every time I looked at it sitting there all half finished and ugly I got annoyed with myself. So, today, I just had to do something. Today was the day of the "quick fix". 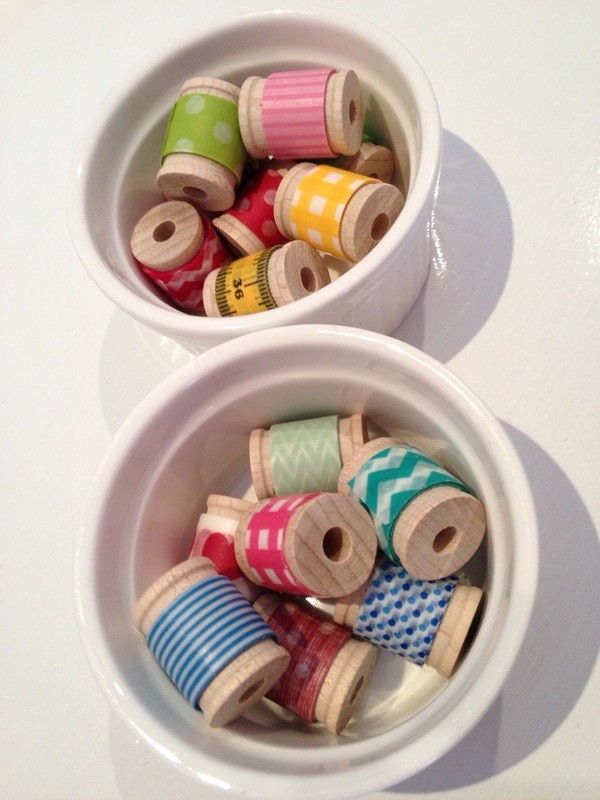 I grabbed some washi tape (remember those adorable little spools I ordered from Etsy an age ago?) and put a different colour strip down each side of the frame - covering up my ugly paintwork and finishing it off in a flash. I know it won't last a particularly long time but it's not something that really gets touched or played with so I'm happy with that. 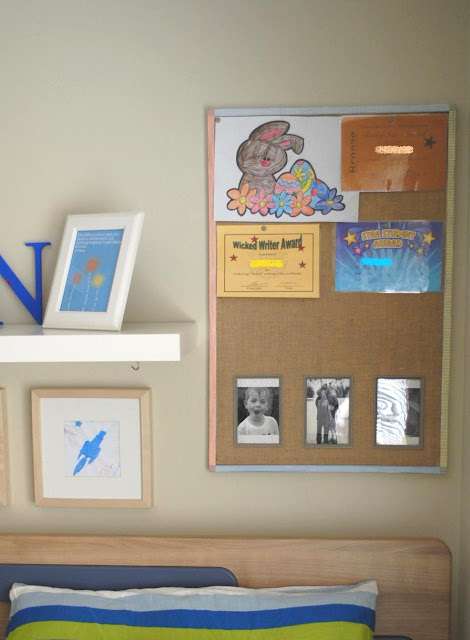 We decided to hang it in our son's room for his own special things - achievement awards, favourite artwork etc - and because our photos are at the bottom he can look up and see us at any time, especially just before going off to sleep. Ahhhhh, cutesy-matootsey. So, not altogether what I had planned for this little Target pinboard but a happy enough solution none-the-less. A quick fix is not always perfect but it's often perfectly good enough.